The Chinese are credited with discovering tea thousands of years ago and a robust tea culture has endured ever since. The taste of tea has become popular throughout the world, becoming a strong part of the culture of other nations as well. Tea is widely embraced and enjoyed by people of all different classes and backgrounds, making it a truly universal drink. There is no right or wrong way to drink tea, only cultural and regional preferences. Tea is enjoyed in both bagged and loose form. It can be made in a clay pot, a porcelain teapot, or a mug. Each day tea is enjoyed by millions of people in various settings and in different manners throughout the world. From elaborate tea ceremonies to quick tea breaks in the office, tea is a part of daily life for people of all different walks of life. It has been embraced for medicinal powers and health properties, enjoyed at social occasions, and consumed simply for hydration. Socially, the British enjoy tea in tea rooms, tea shops, and gardens. The Chinese in tea houses. The Cantonese (of Hong Kong) in dim sum restaurants and other casual eateries. 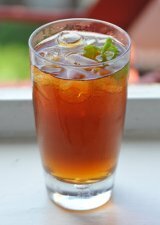 Americans drink their tea in coffee shops and cafes and introduced iced tea to the mix. When the love of tea spread to Great Britain, shiploads of tea would pass through Hong Kong on their journey between China and Britain. And thus, the tea cultures of China, Hong Kong, and Great Britain became intertwined. Tea gained popularity in the American colonies thanks to influence from the British. When the British began growing tea in India, the strong Indian teas became popular in Great Britain and the United States. Black teas from India and China continue to be the most common teas in the West.